Estimated delivery date is very important information that your customers always want to see at least on product pages or in a shopping cart. Unfortunately, the default Magento 2 website lacks this functionality, so we recommend you to solve the problem with the help of third-party Magento 2 modules. 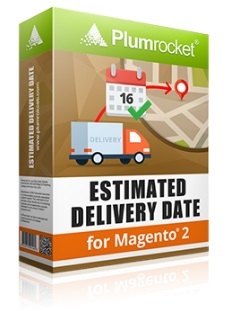 For instance, you can choose the Estimated Delivery Date Magento 2 extension by Plumrocket. 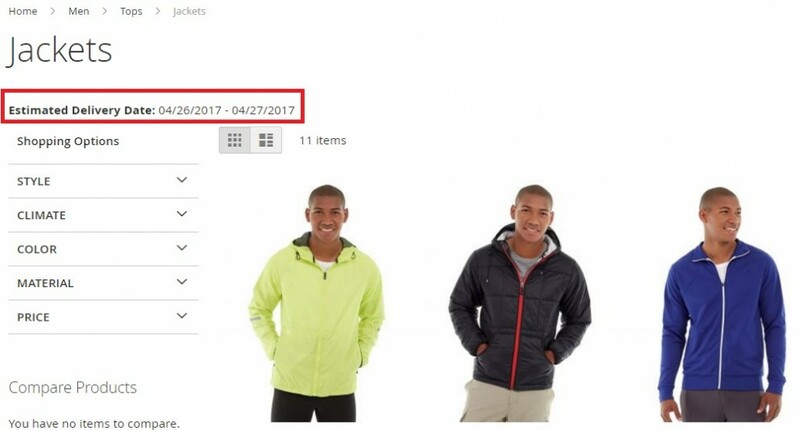 This reliable tool adds estimated shipping dates to product pages, shopping cart, and transactional emails, so you visitors always see the desired information. Module’s core features and backend tutorial are available after the break. As we’ve just mentioned, the Plumrocket Estimated Delivery Date Magento 2 module allows to show estimated arrival and shipping dates on various store pages and in transactional emails (which is very useful, since this information is always available in a customer’s mailbox). Besides, the same data is available in the admin interface, but what is the whole list of supported pages? Of course, you can easily add estimated delivery date to product, category, shopping cart, and checkout pages. Order confirmation, invoice, and shipment emails are also in the list of places that support the display of the vital information. As for the admin interface, estimated delivery date is available on the order page. 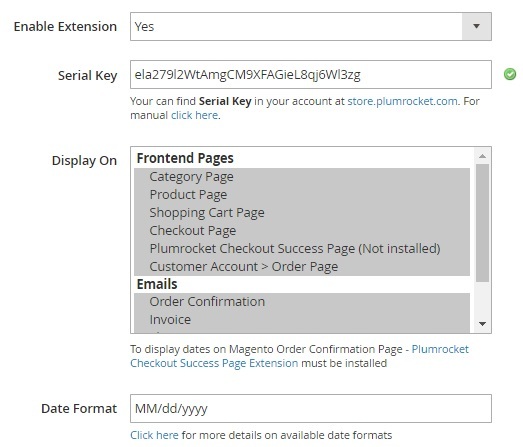 And if you use the Checkout Success Page Magento 2 extension by Plumrocket, it is also possible to enhance the corresponding page of your Magento 2 storefront. Note that the module dramatically improves your backend management. It allows to set delivery dates in three ways. First of all, you can do it globally for the whole store and all products in it. Next, it is possible to leverage each category level separately. 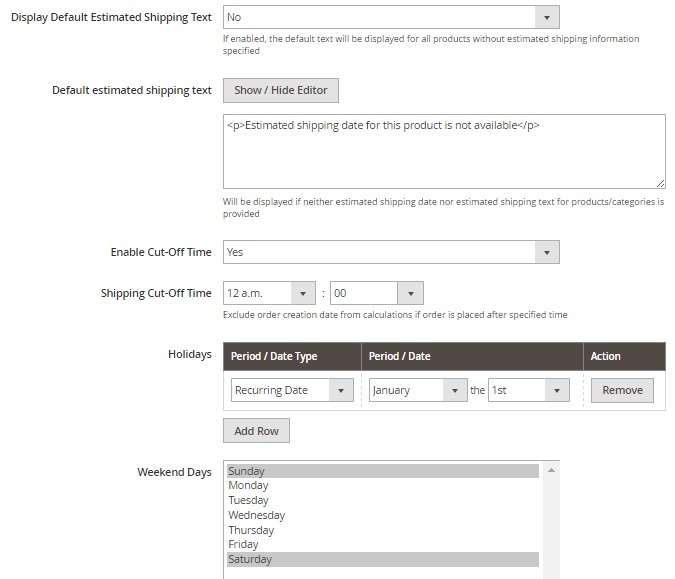 And if you need more precise customizations, set estimated delivery dates for each product individually. Note that products and categories inherit data from the parent category, so you can rapidly add the desired information everywhere. Due to flexible delivery date option, you can fine tune the display of information even more. The Plumrocket Estimated Delivery Date Magento 2 module offers both static and dynamic delivery date options. 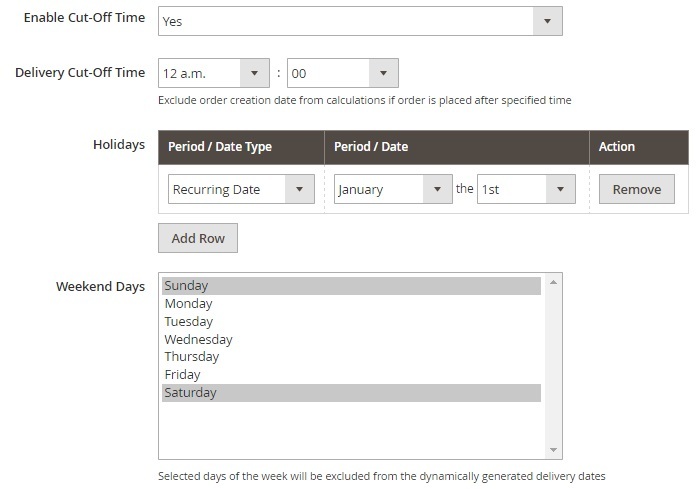 Due to dynamic dates, you can set estimated delivery date in “n” days from today’s date. Besides, it is possible to use a dynamic date range – “n – m” days from today’s date. 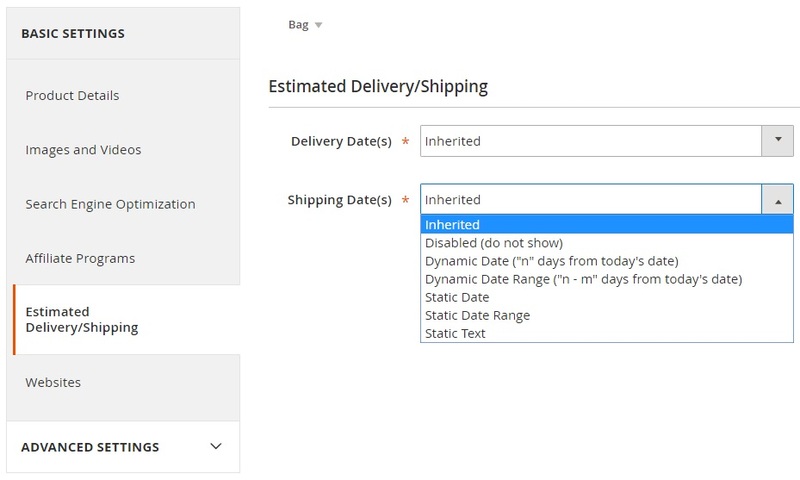 At the same time, static date and date range can be used as well as you can display static text in the estimated delivery date field. As for dynamic dates, it is possible to make them more precise by specifying weekend days as well as local and global holidays. Note that holidays can be set not only as a single date, but also as a period or even a recurring date. Thus, you will never dissatisfy customers with a delivery delay caused by holidays. It is also necessary to mention that the Plumrocket Estimated Delivery Date Magento 2 extension allows to specify delivery cut-off time. It means that you can set time after which same-day shipping won’t be available. These were all core features of the module and now we will explore its admin interface. To configure the extension, go to Stores -> Settings -> Configuration -> Plumrocket -> Estimated Delivery Date. You can find 3 sections of settings here: General, Delivery, and Shipping. Let’s take a look at each one. In the General section, you can enable/disable the extension and enter the serial key. Besides, it allows you to select where to display dates. All places are divided into three categories: Frontend Pages, Emails, and Backend Pages. And of course, you can specify a date format here. As for the Delivery section, it allows to create and then show/hide estimated delivery date text. 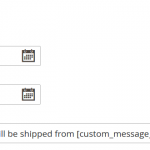 If the feature is enabled, the text is displayed for all products without estimated delivery date specified. Next, specify and enable/disable cut-off time. Note that orders placed after specified time are excluded from calculations. Besides, you can specify holidays and weekends here. As mentioned above, there are three types of holidays: Recurring Date, Single Date, and Period. The same options are available for shipping. This makes sense if you sell to different regions and some customers are situated nearby, while others are abroad. Now, go to Products -> Inventory -> Categories. Under the Estimated Delivery/Shipping, you can specify delivery and shipping dates. Available date types are: Inherited, Disabled, Dynamic Date, Dynamic Date Range, Static Date, Static Date Range, Static Text. 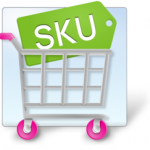 Besides, you can go to Products -> Inventory -> Catalog, select a product, and under the Estimated Delivery/Shipping tab specify unique delivery and shipping dates. It is hard to overestimate how important is the appearance of delivery date on the frontend. Therefore, we are glad to see such useful tools as the Estimated Delivery Date Magento 2 extension by Plumrocket. It has an intuitive backend with flexible settings and all the necessary frontend elements. 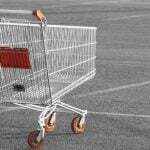 The Magento 2 module costs only $119, while you can buy its predecessor for $79. Hit the link below to get more information about the extension.